Gospel To All Nations (GTAN), led by Fr. 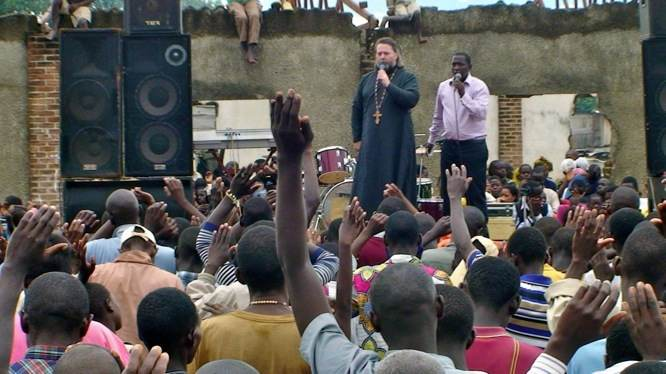 Maximus Urbanowicz, is working to fulfill the Great Commission by taking the “Good News” of Jesus Christ and His Church to all the nations of the world. 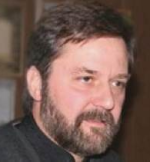 As part of the Orthodox Church in America (OCA), under the omophorion and with the blessing of, His Beatitude, Metropolitan JONAH, Gospel To All Nations actively works for the salvation of souls, equipping the faithful, and building the Church of Jesus Christ through preaching campaigns, church conferences, literature distribution, and mass media. Our prayer is that God will INSPIRE your faith, EQUIP you for evangelism, and IGNITE a passion for the salvation of souls resulting in ACTION. The heart of God is for multiplication of laborers in His harvest fields, through His Church. Fr. Maximus Urbanowicz prays that you will lift up your eyes and join together with Gospel To All Nations in spreading the message of repentance and faith, while reaping the harvest of souls into the Kingdom of God and Church of Jesus Christ. Glory to Jesus Christ! Here is a short glimpse into the Orthodox, evangelistic mission of Gospel To All Nations and the impact they are having throughout the world today. May you be inspired to pray and be motivated to act, because the harvest fields are white, but the laborers are few. Why does he look like an Orthodox Priest, but sound like Benny Hinn. In fact, what did the shouting and affirmation have to do with Orthodox worship? I don’t know, I’m just asking? It wasn’t the Divine Liturgy you were seeing/hearing, it was evangelism. Both are Orthodox, but they are completely different things, done in completely different ways. St Paul the holy Apostle evangelized in the Synagogue, in the public square, anywhere he could find an audience open to the Gospel. As far as the enthusiasm of Father Maximus’ preaching, I imagine Sts Paul and Peter spoke much the same. After all, just reading St Peter’s Pentecostal sermon in Acts shows great enthusiasm –not to mention St Stephen the first Martyr at trial, or St Paul. As far as the shouting and affirmation, this is the normal, Christian/human response to life-changing Good News. We are members of St. Nicholas and when Fr. Maximus preaches you can hear a pin drop. The Holy Spirit just flows from him and people talk about the homily for days. It is always a wonderful message of God’s love. Sometimes priests talk to our minds, Fr. Maximus talks to our heart with great love and enthusiasm. I appreciate Father Maximus’s enthusiasm and fulfilling the Lord’s Great Commission for “Orthodox” Christianity; however, I would like to see the WASP’s arrive to this same country and undo what he has done. Or how about the missionizing teams of the Catholics? That should really confuse these poor people of the third world. This goes on all the time. I find Matthew 28 contradicting here 1 Timothy 4:16. I mean, who is correct? It’s only as C.S. Lewis says “Mere Christianity,” right? Orthodox Christians should do what Matthew 28 states in “making disciples” of all nations, but then having the “right life and right doctrine,” according to 1 Timothy 4:16, is pertaining to which of the doctrines of the tens of thousands of “Christian” denominations? This church believes that Baptism is essential for salvation, this church doesn’t, etc. Is it not possible for our Omniscient Lord to throw us a bone from time to time and set the record straight as to who has the “right doctrine, right faith, right belief?” Isn’t that what the word, orthodox, means? Too many voices too many choices, and too much confusion in the name of Jesus Christ. Didn’t I read somewhere else in the New Testament that the Christian Faith is about “one Lord, one faith, one church, one baptism?” Hellooooo? Are you there God, it’s me, CONFUSED!! And I wonder why the world is so messed up? Please tell me the name of the choir, music, selection and from where obtained. Beautiful! I am excited about this. As a fairly young Orthodox (3 years) I’ve always had problems w/ much of what Orthodox folks say about our evangelism…little more than showing up at Church and people will see and be converted. Simplistically stated but essentially that’s what has been said. I’m glad to see this going on. I do hope though, that the Orthodox do not mimic Protestant ways as in a lot of theatrics…just plain speaking w/ zeal and sincerity. Then go on to make them disciples. Alexis, this has always been a problem for the Church. There are always a myriad of voices calling to people. God is working but we need to work also…the Orthodox need to step up to the plate and aggressively warn people away from Protestants and Catholics. We need to pray also for these people and them Prots and Catholics! David, Protestants and Catholics have Christ too. Orthodox mission, properly understood, is to affirm truth wherever you find it. That means we affirm it in our non-Orthodox brethren as well. That is in no a way compromises your own convictions. You are not violating anything by doing so. Fr. Hans: In order to be fair and unbiased we should perhaps say that ordinary catholic and protestant Christians share genuine Christian faith. – for many, Christianity it is all about long periods of wars. The Holy Spirit is Christ’s “replacement” on the earth. The Holy Spirit is our Counselor, Teacher and guide into all truth. Fr. Johannes, I do know what you mean and I appreciate how the Faith acknowledges truth wherever it be found but Protestants tend to be very aggressive and many times will openly attack us as not even being Christian. They then proceed to teach a stunted paupers gospel and life. I think we should, w/ respect, actively teach people that ours is the true, full Faith and the others are to varying degrees perverted or dumbed down Christianity. Hey David, Good Luck! And if the “other” Christian denominations have Christ, then why bother evangelizing for the Orthodox Faith at all? It is quite clear that we have a God that has not only abandoned us, but He is probably up there laughing at all this confusion and mass hysteria. I recall attending an evangelization conference in April 2006, and a gentleman had asked a very good question, and it was thus: “How do you explain to a Roman Catholic the term, ‘Orthodox Catholic’?” I mean, that’s what Orthodox are, correct? *Except*, there is still Christ in His faithfulness at work through the Holy Spirit in the world and in His Church. My journey has taken me through many varied Protestant traditions, through whose members (and in some respects, in spite of which teachings), the Holy Spirit worked to bring me to faith in Christ and start the process of growing in the knowledge of Him. Ultimately, I’ve found the completion of what was good in those traditions within Orthodoxy. I’m Orthodox because I find within the Orthodox Church the fullness of the faith and revelation of Jesus Christ. On the other hand, there is much within institutional Orthodoxy, because we are all still sinners, that the Holy Spirit still has to work *in spite of* to continue His work of healing in my life! This is the way it is, Alexis. Only if you take your eyes and sense of dependence off of Christ Himself at work by the Holy Spirit in your own heart and start looking around you at the storm of confusion and contradiction that satan stirs up in the world do you sink. Even then a simple, humble cry for help will elicit the Lord’s sure, strong rescue. I’m not here trying to imply that everything will immediately become crystal clear, but there is no excuse or reason for despair. In the world we have tribulation, but Christ has overcome the world. As I understand it, the truth is God works in all hearts that are open to Him, even in those outside *any* Christian tradition (the Holy Spirit is working in the *world,* Christ says, convicting of sin, righteousness and judgment), and will be faithful to guide each of us to the fullness of the truth as we have the capacity to receive it. I think the important thing for someone like you is to determine at least to be faithful with God’s help to what *you* know is right. Keep Christ’s commands to the best of your own understanding and ability. In His own good time, and when you are ready, He will then reveal more until it becomes more clear to you, where it is important to your own salvation process in Him to know, who is “right” on whatever issue. The fact is Christians in many other traditions are right about a good many things that the Scriptures teach, and depending on the maturity of the Orthodox Church member to whom you are speaking, he/she may be wrong about a good many things as well! The most important thing to know and trust, istm, is that Christ will be faithful to complete what He has begun in us (regardless of the various ways satan tries to mess that up) if we will only commit to trust and obey Him despite all that we see. As for those who need to hear the gospel, because of Christ’s faithfulness I believe those who are ready will hear what they need to know when they need to know it. Experience has taught me God is quite an Expert at creatively working in and through some very broken and leaky vessels and using the most apparently “foolish” means to accomplish His work of readying hearts and then sowing His word in fruitful soil to yield the harvest of righteousness He is seeking.